A river, by definition, refers to movement. 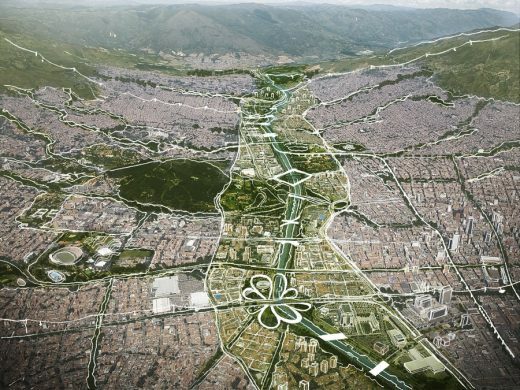 Only if we interpret the Medellin River area as a single geographic entity composed of natural elements (fauna and flora) and artificial (history, culture, mobility) do we understand that the opportunity presented by this call goes beyond the area defined for the contest. This is why we consider it important to think of the river territory beyond a simple design of public space. It is the opportunity to re-structure and establish a framework for the future development of Medellín. Our approach takes advantage of this situation to create new principles for the development of the city, using all available resources (natural, social, economic, political, and cultural) to link the city with its history, its ecology, and the movement of people in the territory. The budget of 83 billion pesos is an insufficient amount to completely redesign the entire area at the highest standards. The financial strategy for the development is a glaring issue of our proposal. On the one hand there is an urgency to improve damaged parts of the river first; on the other hand, there is the notion of doing a few specific projects at the highest quality of design and execution that initiate a full development of public space by the river. Our project aims to achieve both simultaneously. We identify “special projects”, where the priority is to achieve excellence in the design of public spaces investing the necessary resources, while a number of simple strategies aim to show how much of the margin of the river can be recovered naturally in a first phase and with a modest investment. By reusing existing elements creatively such as infrastructure, thinking about fundraising, understanding the various movement patterns and creating mechanisms for citizen participation; this project aims to go beyond what the task given and to think also about money, time, and the power of people. Public spaces must transcend the beautiful, must be rooted in local culture and identity necessary becoming more and various active spaces. The spaces for nature occur easily, but spaces for events of various kinds are still scarce. You need to have places to play, live, and interact in public which are relevant history and local identity. Ideas of history and identity are key to any city. Currently many cities choose to erase/cover ‘undesirable’ history and forms of the city with classic forms of public space. Our proposal is to as much as possible to reuse the existing city forms and to reinterpret them in a more contemporary, people friendly manner. This is will remain more true to the city’s collective memory, provide a richer public space and be massively more efficient in terms of investment spending. Working with ‘found objects’, as it is called in the art world, the proposal grounds the design in its place. Much of the land available along the riverfront is trapped in cloverleaf car interchanges. Additionally, those spaces are filled with much of the mature plant life of the waterfront, but are unreachable spaces for pedestrians. By simply removing the ‘inner leafs’ of the interchanges, pedestrians can access these spaces. In combination with the removal of half of the roadway next to the riverfront, much more space is given to people. The existing asphalt is reused and reinterpreted for pedestrian paths, activities, etc. The existing road bridges are adapted to provide grand pedestrian access points to the riverfront. Further, this removal of the ‘inner leafs’ steam lines the amount of cars given access to the riverfront. It can still function as a driving corridor but is treated as a boulevard and no longer permits drivers to do every single movement. It allows on, off movements which will transform the riverfront boulevard to a place to cruise, not to commute. Medellin is an incredibly ambitious. Luckily, its ambitions exceed their current reality. Like New York, Paris, London, Barcelona and many others before her, Medellin dreams big. But unlike those cities, it lacks the financial reality of those cities, not to mention the problems that need to be addressed urgently. This is why it becomes necessary to harness the ambition and creativity that prevail in the region to address and meet the goals that the city has set. With the creative and efficient use is made of available resources, this project can become an icon that symbolizes the progress of Medellin. It is not to replicate what these cities are or have, simply by identifying what makes one can reinterpret Medellin and highlight what makes it different. If you face the realities in a clever and efficient way, Medellín has the opportunity to strengthen and even end up being bigger than anyone’s dreams.